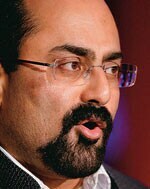 "Corruption, nepotism...are symptoms of a deep-rooted malaise in our governance," argued Rajeev Chandrasekhar, one-time telecom magnate and now independent Member of Parliament, at the India Today Conclave. "Corruption, nepotism...are symptoms of a deep-rooted malaise in our governance," argued Rajeev Chandrasekhar, one-time telecom magnate and now independent Member of Parliament, at the India Today Conclave. He rued the lack of independent regulators, telling Business Today if the unholy nexus of business and politics was to be broken, "we need not just a strong judicial system but strong regulators". Speaking alongside Arun Shourie, politician and former journalist, and real estate baron K.P. Singh, Chandrasekhar said businesses should push for changes and a framework where success derives from enterprise and innovation, and not from proximity to politics. "When I was the odd one out in the belief of auctioning spectrum, I remember telling a telecom friend that a business strategy that depends exclusively on gaming the system of proximity to power will always invariably be bested by someone else who is better at gaming and fixing the system," he said.